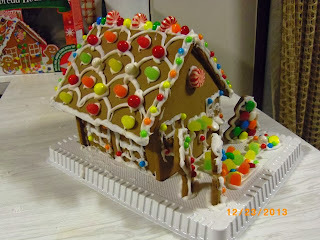 Patra's Other Place: Gingerbread House and other photos. 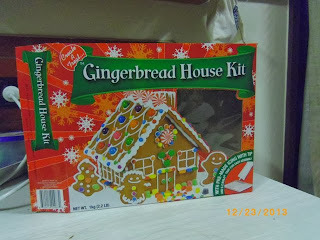 Last year I made a gingerbread house for the first time, and it was a huge success with the younger members of Ken's family on Christmas Day. It took me ages to decorate it because not only was it the first time I'd ever done one, it was a hot night, and the icing wouldn't set properly, so the end result was a bit wonky. I bought another kit about a month ago, and constructed it tonight. It is quite cool in Melbourne at the moment, and I had no trouble with the icing setting quickly, so it took much less time and effort. It is a shame that we won't be seeing Ken's family this year, and I debated whether or not I should have bothered. But I'm working at the opshop on Christmas Eve, so I have decided to take it there, and let our customers and their kids all have a chunk from it! While this was being done, I had a little audience in the kitchen. 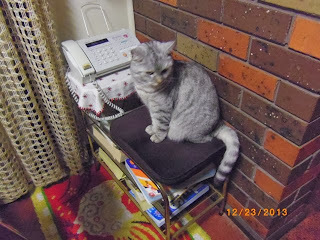 Tiger sat on the telephone seat where he could see me. 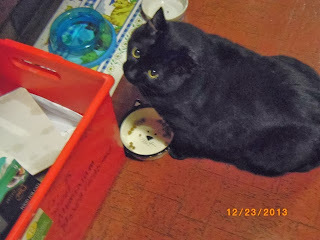 But after sitting on the floor nearby, Topsy lost interest in me, and went over to her food bowl which was empty. You can read her mind from those eyes! "Why don't I have any food here?" I keep forgetting your in warm weather right now. Woke up to neg. 22 degrees. It is supposed to warm up and maybe even snow for Christmas. Hello to the fur babies.